As convenient as it is to type URLs or search terms with the keyboard of the Samsung Galaxy S 5, you’ll find it’s usually faster to bookmark a web address that you visit frequently. Making bookmarks is a handy way to create a list of favorite sites that you want to access over and over again. A bookmark is roughly the equivalent of a Favorite on a Microsoft Internet Explorer browser. Press and hold the Menu button. Doing so brings up a screen with all the bookmark options. Chances are that your carrier already put a number of bookmarks on your phone. Some are for popular sites; others help you manage your account. The point is that you can add your own sites. Tap the grayed-out star icon. Doing so brings up a screen that looks a screen to add bookmarks. The first textbox is the name you want to call it. In this case, the default is Local and National Weather Conditions & Forecast — Weatherbug.com. You can choose to shorten it to just Weatherbug, or anything you want to call it. The second textbox is the web address (URL). You probably want to leave this one alone. The third textbox here says mobile bookmarks. Tap the Save button at the bottom-right corner of the screen. This puts a thumbnail of the website in your Bookmark file. Now that you have added a bookmark, it would be nice to be able to find it. Before you go there though, wouldn’t it be nice if all the bookmarks from your browser were to magically appear on your phone? If you use Google’s Chrome browser on your PC and signed in with a Gmail account, there is some good news: Your bookmarks are already on your phone! Desktop Bookmarks: You can find your all bookmarks from the Chrome browser on your PC in the Desktop Bookmarks folder. Just open this file folder and there they are. 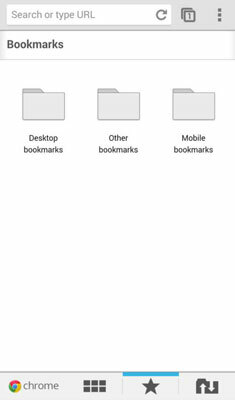 Mobile Bookmarks: If you open your Mobile Benchmark browser file, you will see any Bookmarks you have saved on your phone. Other Bookmarks: This file is for bookmarks that you want to save but do not want to see every time you open your Mobile Bookmarks file. If you find a site you like while browsing on your mobile device, but want to use it on your desktop, this is easy to arrange. 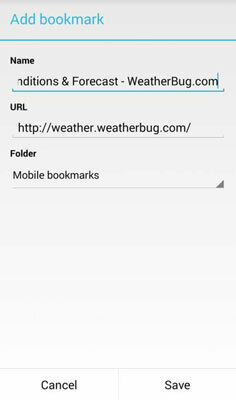 There are options to saving a bookmark on the “Mobile Bookmarks” file. Simply change the filing location to “Desktop Bookmarks” and tap Save. A bookmark for the site you found on your mobile browser will appear on your desktop PC! View Recent Closed website: When you click on these six rectangles, you see thumbnails of websites that you recently closed. Bookmark Files: The way to navigate to the bookmark files is to tap the Star icon. To get to the top level file, you tap on the link that says “Bookmark.” This is an active hyperlink that takes you back to the root of the filing system. View What is Currently Open on your PC: Are you ready to be blown away? Tap this icon, the file folder with up and down arrows, and see any tabs currently open on your PC! Bookmarks are cool and convenient, but you don’t always want to save them forever. When a bookmark has served its purpose, rather than have it take up prime real estate on your Bookmarks screen, you can move it or delete it. Start by pressing and holding the thumbnail of the website. To delete a bookmark, tap Delete Bookmark. Your phone confirms that this is indeed what you want to do. Tap Yes and the bookmark is gone. On the other hand, if you are unsure, you can just move it to the “Other Bookmark” file. Tap the Edit Bookmark option, and select the Other Bookmark file to spare its digital existence for another day.